What's with the Spirals? 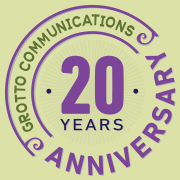 | Grotto Communications Inc.
"The spiral is a spiritualized circle. In the spiral form, the circle, uncoiled, unwound, has ceased to be vicious; it has been set free. …Twirl follows twirl, and every synthesis is the thesis of the next series. "If we consider the simplest spiral, three stages may be distinguished in it, corresponding to those of the triad: We can call "thetic" the small curve or arc that initiates the convolution centrally; "antithetic" the larger arc that faces the first in the process of continuing it; and "synthetic" the still ampler arc that continues the second while following the first along the outer side and so on." Nabokov's notion of the spirited spiral is so intriguing. His chewy description is dramatically intellectual, yet embraces a poetic sensibility. I adopted the spiral as our company logo to remind us and to guide my clients on the wisdom of breaking vicious circles, while honoring the elements that create the current environment. My exploration of change in my life — both personal and professional — embraces the imagery of an upward spiral, building on pertinent pieces of the past while adding new learning, coaxing a shift toward long-term goals.